Lay out the lilies; shed a sad tear. He is no more. For what's seemed like Millennia Paul McKenna has hung over the Chester platform at Hamilton Square. His book aimed at boosting your confidence through pseudo science (with a free CD) has been plugged on a poster for so long there have been whispers about devilry at work. Perhaps the former Chiltern Radio DJ had used his hypnotic powers to enslave someone at Rail House, ensuring that his poster remained long after all others died. While every other campaign withered and perished, replaced by a different push for the Mersey Ferries or the Young Person's Railcard, Paul carried on. His blank eyes stared. He WILL give you confidence. And perhaps feel you up while you're under. No more. Paul McKenna's reign of hypnotic terror has ended. Now we have a builder doing the 100 metre hurdles. Yes, it's for the Olympics, along with everything else in the country at the moment, but I welcome it. That man in the 2012 t-shirt represents freedom from tyranny. An escape from the yolk of a madman with a pocket watch and a weirdly soothing voice. We're free. FREE. (The ad for cancer insurance is still there though). Haha! I noticed this as well! Although it now means it will look more obviously dated in ten years time considering the emphasis will be on 2012 and we know it will still be there (I bet it survives the refurbishment). That cancer advert must be all that remains of Virgin's highly criticised, highly controversial, long defunct cancer insurance. 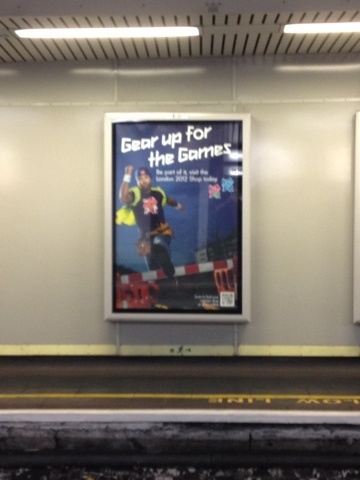 I don't get why Merseyrail seems to do so badly in terms of attracting advertisers. You get big national companies taking up plenty of advertising space at stations up and down the country whereas here it seems to be restricted to local companies, public services and Merseytravel with the occasional big-name finding its way through. I'm sure some people prefer it this way but it would be a real earner if they got some big ones on board. I just don't get how Liverpool Central, one of the busiest stations in the country, fails to attract a large number of advertisers. There has to be some contact involved, some weird ancient agreement that means ads from CBS Outdoor are restricted to the escalators and stairs. I can't understand why the track level ads are so bad otherwise. As you say, they're restricted to National Rail/Merseytravel/Merseyrail promos, and I don't get why you can't stick an ad for Men In Black III in there or something.